“Our stated goal is for European nations to speak with a co-ordinated voice in the United Nations. “Germany has just started a two-year stint as a non-permanent member alongside France on the UN Security Council. That strengthens Europe’s voice in the concert of world powers,” she added. Last year, Germany had asked France to give its permanent seat on the Security Council to the EU, so that the bloc can “speak with one voice” — a request France declined. 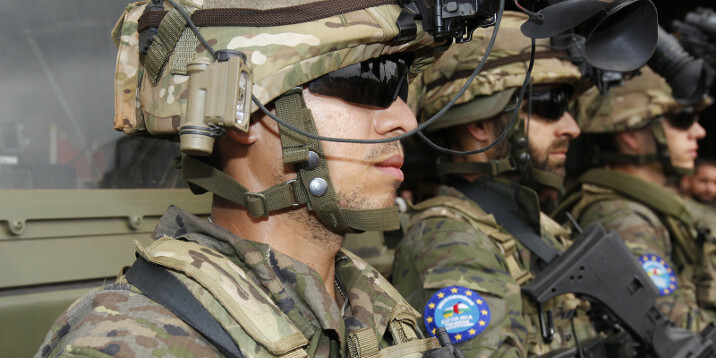 A common European defence force was labelled a “dangerous fantasy” by remain campaigners during the 2016 Brexit referendum, after Eurosceptics had warned that continued membership of the bloc would entail being pulled into an EU army. However, Brexiteers’ predictions of a common defence force were proved true in November 2017 when 23 nations signed up to the Permanent Structured Cooperation process, or PESCO. PESCO is key to the Defence Union plans set out by President of the European Commission Jean-Claude Juncker, who had declared just two months prior that the EU needed a fully-functioning army by 2025. Germany and France began to take the lead on the defence project, in November 2018, after French President Emmanuel Macron said that the EU needed a “real European army” to defend itself against China, Russia, and even fellow NATO member the United States. German Chancellor Angela Merkel enthusiastically backed her French globalist ally, saying, “What is really important, if we look at the developments of the past year, is that we have to work on a vision of one day creating a real, true European army,” with Brussels bureaucrats expressed their “delight” that France and Germany were taking the lead. On Friday, the bloc’s top military official Claudio Graziano said he had been working with other EU army chiefs to thrash out what can be done to enhance the bloc’s capabilities, saying there is “a lot of expectation” about what the EU can undertake.